Every field or area of expertise has it's own jargon, and navigating the textile world can be confusing because of the terminology used to describe fibers and fabrics. As with any specialized vocabulary, it's purpose is to help us communicate precisely and to reduce confusion. But all that terminology can cause confusion, especially if you're not a professional or if you're new to a subject area. One of the biggest stumbling blocks for people just learning about fabrics is the difference between fiber content and fabric weave (or fabric type). For instance, someone who wants to sew a prom dress might go to the fabric store looking for satin. A knowledgeable sales person would ask: What kind of satin would you like? This question might produce a puzzled look on the face of the customer, who's thinking: You know, satin, that kind of shiny fabric. Hopefully the sales clerk would follow with the explanation that the store carries silk satin, polyester satin and acetate satin and then show the customer the various choices, pointing out the range of prices. The above scenario illustrates the difference between a type or weave of fabric (satin) and the fiber content (silk, polyester, or acetate). Understanding textile terminology is simplified if you tackle the fiber content first. Natural Fibers. There are four major natural fibers. Wool comes primarily from the fleece of sheep or lamb, but can also come from the hair of other animals, such as goat, camel, vicuña, alpaca, llama, or rabbit. Silk comes from the cocoon of the silkworm. Cotton comes from the downy substance that surrounds the seeds of the cotton plant. Linen comes from the fibers that lie under the woody stems of the flax plant. Man-Made Fibers. The advancement of man-made fibers in the last decades has been staggering. And they are now deservedly well regarded by many sewers, especially compared to the early polyesters of the 1950's. Man-made fibers are manufactured by first forming a liquid slurry of the particular product being used; the liquid is then forced through a spinneret (similar to a shower head); the stringy liquid that's extruded is called a filament, which is referred to as a continuous filament fiber when dried. Some man-made fibers are produced from cellulose, which is plant material - usually purified wood pulp. The other man-made fibers are completely chemical-based, often including a petroleum product. Acetate is made from a cellulose base that is treated with acetic acid (celanese, which was popular in the 1920's, is in the acetate family). Acrylic is made from the chemical compound polyacrylonitrile. Lyocell is cellulosic and is more durable than rayon. Metallics were originally filaments of the actual metal, but today they are usually plastic or polyester films with metallic particles, or a core yarn with a metallic twisted around it. Nylon was the first completely synthetic fiber to be produced (1938). Olefin (also known as polypropylene and polyethylene) is made from petroleum by-products; it's excellent at transporting moisture and so has a "wicking" capability. 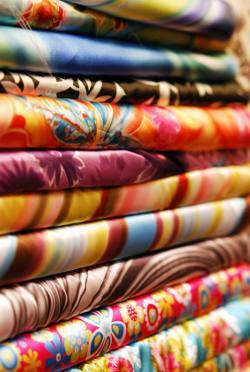 Polyester is made from petroleum chemicals. Rayon is cellulosic; viscose rayon is more common than cuprammonium rayon. Spandex is a synthetic elastomeric yarn; a core thread of spandex is often covered with a non-stretch fiber. Triacetate is a blend of fibers in the acetate family, and is more heat resistant than acetate. The secrets of the fiber world start to unfold! If you've wondered why you are comfortable in that rayon dress on a hot summer day, it's because - even though rayon is man-made - the fibers were made from plant material.